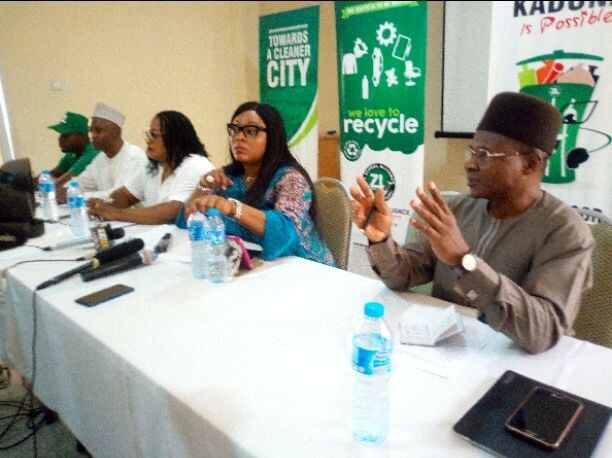 Kaduna State government on Saturday warned all unauthorized waste collectors operating in Kaduna, Zaria and Kafanchan to stop collecting waste and levies from residents of the state because there is new law in place that forbid any individual from doing so. The State government had in 2016 launched a door-to-door waste collection initiative where only the approved waste collection company known as ZL Global Alliance (ZLGA) was permitted to collect solid waste across the state while other individual collectors were encouraged to register with ZLGA if they want to continue but not to collect levies which many of them are yet to comply one year after. Speaking shortly after a joint meeting with ZLGA, Ministry of Environment and Natural Resources (MENR), Executive Director, Finance and Administration, Kaduna State Internal Revenue Services (KADIRS), Ahmad Sabiu said, the need to improve Internally Generated Revenue (IGR) in the state in order to have more funds to implement people oriented project made the state government come up with the law in this direction. According to him, KADIRS is the only recognize authority to collect revenue across board on behalf of ministries, departments and agencies and even the local government areas through Point of Sales (PoS). “So, all monies due to government including levies should not be paid to individuals but through banks over POS. The whole idea like I said earlier is to block leakages in order to have more money available to government”, he stated. Director of Environment, State’s MENR, Ahmed Salihu reiterated the commitment of the state government to having a cleaner environment through engagement of ZLGA under which others must register so the state can have a structure to work with. The Director, who said the state government was satisfied with the services of the waste management company though there is always a room for improvement said, no individual is allowed to collect revenue on behalf of the ministry or any other authority of Kaduna State government. Earlier, Chief Executive Officer of ZLGA, Abiola Bashorun hinted that, the Saturday meeting was called to review her company’s activities and also to sensitise everyone about new revenue collection law of Kaduna State which states that, no individual is allowed to collect revenue for the government and no revenue as much as possible should be paid in cash. “We also want them to know that ZLGA and State’s Ministry of Environment and Natural Resources have keyed into this law to create a better structure and effective waste management initiative in Kaduna state. “This is aimed at curbing unnecessary payment of waste levies because the state government has observed that, there were some unauthorized waste collection companies going round the state collecting waste and levies especially now that no individual is allowed to collect revenue for the government. The law says the waste belong to the government and you cannot say you are part of the government business without been with government. “We are now saying come and register with ZLGA and key into the strategy of this revenue collection. Nobody is loosing his job. Nobody is loosing his area. All we are trying to do is to help the government to put structure in place in the interest of the good people of the state”, she explained.